The 1960s held promises, many which did not live up to expectations like drug induced insights, free love and geodesic domes. Domes captured the imagination of the youth at the time as did most things that broke with tradition. In the case of geodesics, the break was visually very obvious. Built from a network of triangles, the resultant structure was aesthetically pleasing. Many were the advantages and benefits. And many were the disadvantages and problems, largely unspoken of at the time but obvious to those that made a commitment to this type of structure for a home. Geodesic domes were popularized by R. Buckminster Fuller. They were promoted for their efficiency, strength, stability, light weight and ability to be built quickly. There was hope that the geodesic dome would become a housing solution. But many problems surfaced - curved rooms with attendant diffiulty in design and furniture placement, many seams prone to leaking, higher window costs, triangular panels resulting in more material waste, etc. Their success has now been primarily in its adoption for specialized commercial applications such as pavilions, auditoriums, weather observatories, and storage facilities. read more about them here. The one in the photo that can be seen in the window reflection is Fuller's Fly's Eye Dome which has been erected in Laguardia Park across from the AIA center. Read about the sign here. See here for photo of dome with a few visitors climbing the structure. 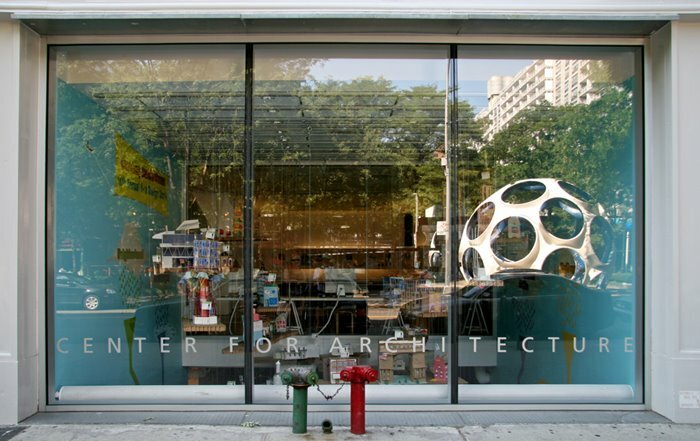 The window is that of the Center for Architecture - the New York chapter of the American Institute of Architects. Buckminster Fuller and his work is an enormous subject. Read about him here. There is also more information about Fuller there at the Dymaxion Study Center at the AIA Center at 536 LaGuardia Place from 6/23/08-9/14/08.